I just finished another book of Kobo Abe (安部公房), called “The Face of Another” (他人の顔). It is the story of a person whose face got severely damaged in an accident, and who builds a new face. 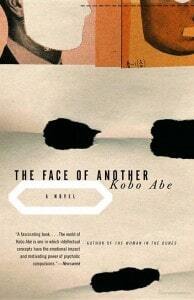 Like Woman in the Dunes, the first book of Kobo Abe I read, a story very strange and very startling. The Woman in the Dunes, which also made it into a movie, was recommended to me by a good friend. I read – no I devoured this book. An extravagant story of a man getting lost in the dunes not to return. The movie, from the mid-60ies, is a piece of art by itself, too. So my expectations were very high when starting “The Face of Another”. The story is divided into three so called notebooks, telling the story of the scientist whose face got seriously burned. After this his life changes completely, the connection with his wife is getting worse and worse. He decides to create a new face, a mask, nearly perfect. He succeeds in tricking everyone to accept his new identity. But his ultimate aim is to open the way of communication with his wife again. The book is full of philosophical ramblings on the meaning of faces in our society. While the beginning and the end of the book are excellent and I had a hard time stop reading, in the middle there are some passages that for my feeling got too long and too philosophical. But overall I can recommend the book for advanced readers. One interesting point of the book is the obsession of the main figure – or the author? – with faces, identities, communication. But living in Japan and seeing it from the perspective of a society that forces a permanent succession of mask onto the faces of its members (迷惑をかけないように！) under any circumstances, the book not only deals with the one instance of the scientist, but fundamentally also with Japanese society, and the disaster of loosing one’s face. While not up to the Woman in the Dunes in my opinion, it is still an excellent piece of Japanese literature worth to be read.